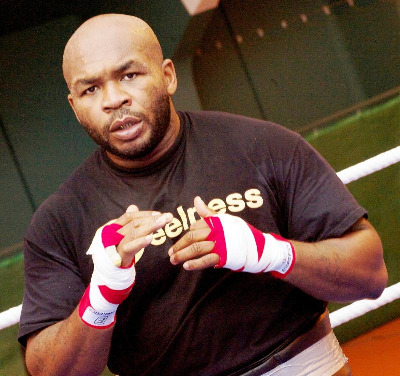 Heavyweight Sherman "Tank" Williams (38-15-2) face Brazilian Mateus Roberto Osorio (9-2) in Aarhus, Denmark, December 3 in a scheduled eight-rounder. 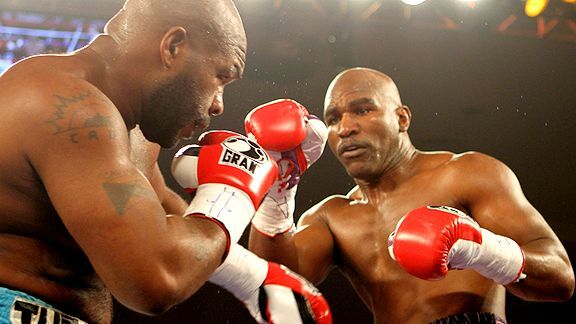 Promoters Brian Nielsen and Mogens Palle are nursing hopes of matching Williams (pictured above) against Evander Holyfield, now 54 years old in what would be a rematch of their fight back in 2011 that ended in a controversial No Contest with Williams ahead on points. Holyfield was contacted in the matter by a Danish paper and didn´t rule out a comeback under the right financial circumstances. Holyfield's last fight was in Denmark against Brian Nielsen back in 2011. Also on the Aarhus bill is supermiddle prospect Daniel Heinze (5-0) who is in against Jose Hilton Dos Santos (36-17-1) also from Brazil and superlightweights Osama Hadifi (11-2) and Enock Poulsen (1-0) clash in an all Danish matchup. Supermiddle Lolenga Mock tops as previously reported the bill and face Argentinan Ruben Eduardo Acosta. It was offically on but now it is off: Tuomo Eronen will not, repeat not, face Guillaume Frenois December 15 in St Quentin for the IBF Int´l superfeather title. The official reason is weight problems - Eronen have mainly campaigned at featherweight and is viewed as too small for 130 lbs. EC Boxing have announced that IBF Int'l heavyweight champion Adrian Granat (14-0, 13ko) will defend the title March 18 at home in Malmoe, Sweden. As for opponent there are ongoing negotiations with Romanian Bogdan Dinu (16-0, 12ko). The Martial Arts Law that regulates all martial arts sports including professional boxing in Sweden have in a fact a paragraph that states that participants in fights longer than 12 minutes (all fights over this distance need special permission from the Martial Arts Delegation) must be presented 60 days before fight date. Previously the Martial Arts Delegation have allowed exceptions, especially for undercard fights over 6x3, but beginning of 2017 not anymore. In case of a substitute the procedure of applying for a longer distance must be done again and the closer to fight date the more difficult it gets. One fight that has fallen victim of this is heavyweight Otto Wallin's fight December 9 in Nykoping. First Newfel Ouatah was the opponent, then Eugene Hill (officially announced as opponent) and finally Nagy Aguilera. Sauerland have now moved Wallin to the show in Sofia December 3 where he will fight an opponent to be announced.